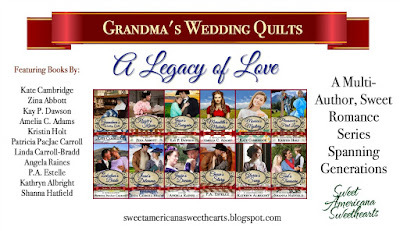 I'm pleased to announce my contribution to Grandma's Wedding Quilts is now available! Pleasance's First Love is 66% off until midnight tonight. Grab it for kindle before the price goes up! His worst mistake was letting her go. His second-worst mistake? Bringing her home. No one will ever know how badly Pleasance Benton's abandonment threw Jacob Gideon. He landed hard, hard enough he didn't care to find a replacement. Now that he needs a woman, he figures the safest way is to order one from a catalog. Pleasance is back to reclaim her rightful place at Jacob's side. One way or another she'll remind him theirs is a match made in heaven...once the shock wears off. The teensy-weensy problem? 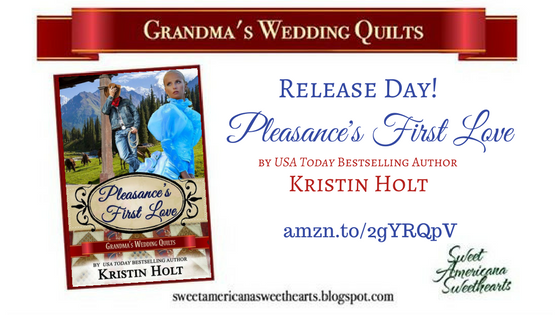 Jacob doesn't know that she--his first love--is his catalog bride. A tremendous, awful ache burned. Fire chewed at her resolve to see this through, to rebuild a new life with him from the ashes of the former. Was this how he’d felt when she’d left? She’d been traveling to something, not away from him. But he’d not understood. The warm summer sun could do nothing to banish the sudden chill. He’d braced his forearms on his knees, effectively blocking her out. He faced the road ahead, turned his head just enough to glare at her through narrowed eyes. “One: every word I wrote was the bald truth and you chose me.” He’d said as much, in his letters. He’d had nearly twenty replies through the matrimonial agency he’d enlisted to find his bride. He’d selected her. “Second, you must marry to meet the bankers’ stipulations and secure the loan you need.” He’d written all about the ranch, his plans, and the roadblock in his way. He shook his head, rejecting her reasons. Without giving him a moment’s warning, she tossed herself into his arms. She would kiss him with all the longing four tortured years had inspired, and prove nothing had changed. She landed across his knee. As if by reflex, he caught her close. She fit in his arms perfectly. The first touch in four anguished years banished the chill. Heat engulfed her. Breath left his lungs. He moaned. This first reunion kiss was…amazing. The rasp of his beard awakened her senses. The fullness of his lips reminded her of every kiss, every touch, an entire history of courtship and love binding them together. He kissed her as if he were starving, and she, his only sustenance. His kiss intensified, deepened, made her forget—almost—they were in the open, in public. Anyone could witness this private, beautiful exchange. One kiss became five. His hands swept her back, and eventually settled upon her hips. She’d locked her arms about his neck early on, and she wished she’d removed her gloves. She wanted to feel the silk of his hair and heat of his skin. Gloves were such a nuisance. Jacob must have remembered they were in his wagon. On the side of the road to Leadville. He stopped kissing her, holding her, loving her. Reluctantly, she allowed him to set her aside. She shivered. The powerful kisses had burned his anger to ash. “I know.” He wouldn’t trust her for a long while. She knew that. Just as she knew everything about this dear, wonderful man. “I know.” She understood. Truly, she didn’t expect better. He’d written to Ann Robbins. He’d proposed marriage to Ann Robbins. He’d built a level of reserved trust, with Ann Robbins. 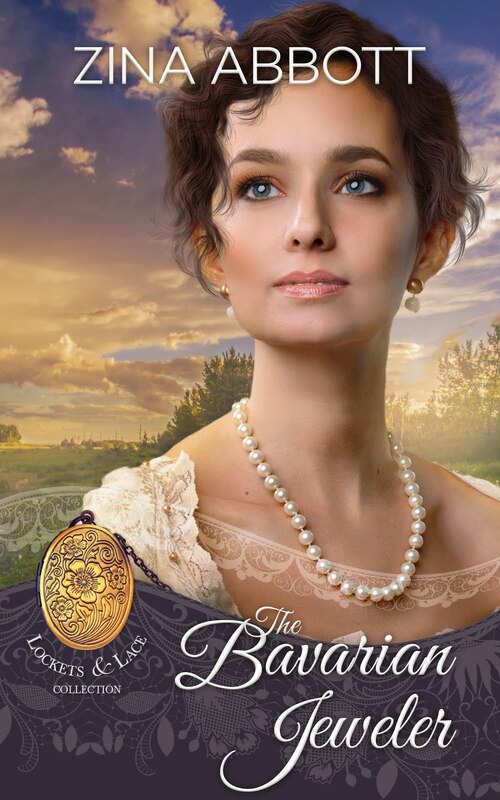 If Ann weren’t she and she weren’t Ann, Pleasance would have known a fit of jealousy sharper than the day she’d received a letter from dear Mrs. O’Kane, telling her Jacob sought a catalog bride. She’d known in that moment what she must do. To keep track of any games, parties, contests and special information about the Grandma's Wedding Quilts series, please "like" and follow the Grandma’sWedding Quilts page on Facebook by CLICKING HERE. 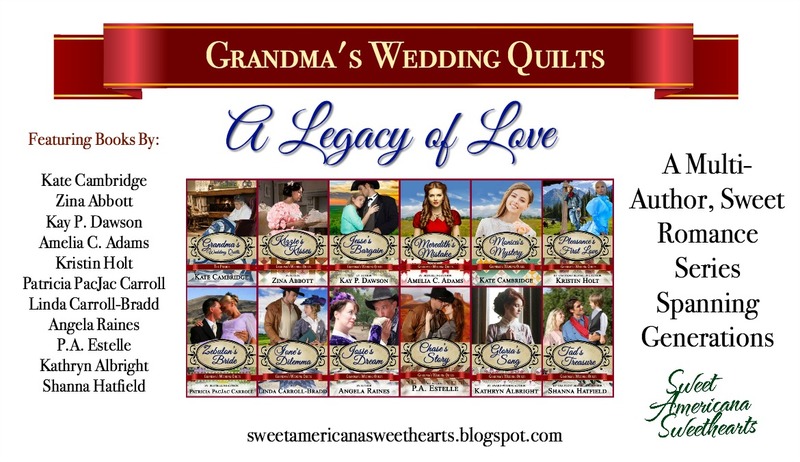 The Sweet Americana Sweethearts authors plan to keep writing together to create more book series. You can keep track of our progress two ways. 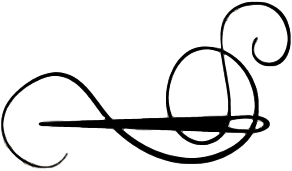 First, please sign up to follow this blog, SweetAmericana Sweethearts blog. 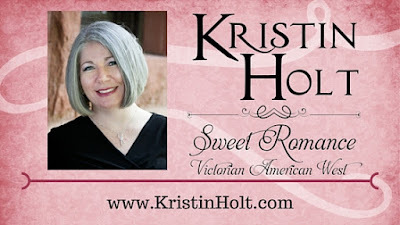 To learn more about Kristin Holt, visit her Sweet Americana Sweethearts author page: CLICK HERE. I write frequent articles (or view recent posts easily on my Home Page, scroll down) about the nineteenth century American West–every subject of possible interest to readers, amateur historians, authors…as all of these tidbits surfaced while researching for my books. 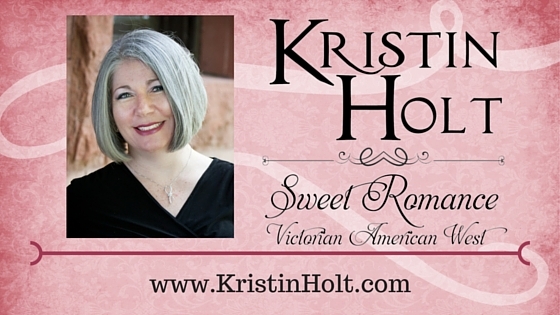 I also blog monthly at SweetRomance Reads, Sweet AmericanaSweethearts, and Romancing theGenres. Can't wait to get this read, Kristin! Sharing! It sounds amazing. I am hooked. Thanks for the great price.